Popular sources like Economix and John Oliver have been circulating misconceptions abound regarding the Transatlantic Trade and Investment Partnership (TTIP), Trans-Pacific Partnership (TPP), and Trade Promotion Authority (TPA). These objections caught my eye not solely because TTIP, TPP and TPA are all confusing initialisms with a lot of capitals T’s, but because they were generally not the blatantly false usual objections universally rejected by economists (e.g. free trade is bad, drives down wages, benefits only corporations and kills jobs). Meanwhile, some staunch otherwise advocates of free trade and globalization, most notably Paul Krugman, have opposed the agreements. Regardless, much of the concern to the three agreements is confused and confuddled. The Senate recently passed the TPA, thus pending a House vote will grant the president fast-track authority in order to negotiate trade agreements. Critics have expressed concerns over whether fast-track authority, which allows the president to negotiate trade agreements in secret and without congressional consent, allows corporations and special interests greater control over the negotiation process. However, these misgivings are extremely misguided. First of all, the TPA does not unconstitutionally grant the president powers to pass trade laws willy-nilly as he pleases. As former Attorney-General Ed Meese’s notes, this is because Congress still retains its ability to reject and approve whatever agreement is negotiated. Furthermore, the TPA is not some unprecedented act. Since FDR, every single president has been granted fast-track authority at least once for secret trade negotiations. This is good, too, as fast-track authority is universally supported by economists. Assuming the president is pro free-trade, which, thankfully, most presidents this past half century have been (well, at least their economic advisors have been), granting him the ability to negotiate in secret actually enables him to negotiate the best deal for Americans free from outside special interest groups’ influence. Trade agreements typically are held in closed quarters without releasing drafts to the public for the same reason compensation negotiations between employees and their bosses are not released. Namely, the parties involved virtually always overreach and demand ridiculous things they are unlikely to receive. What bargainers want is not what they demand during the ongoing negotiations, as they make initially unreasonably great demands that can be bargained down. To release working documents of all steps involved in this process undermines everyone involved. Fewer negotiators also means less rent-seeking and thus fewer attempts to influence the process. It may sound counterintuitive, but granting Obama or any other president the ability to go off and negotiate deals in secret only to have them approved by our democratically elected representatives months later is the best way to handle negotiations for all Americans. Additionally, as international trade attorney Scott Lincicome points out, many fast-track enabled Free Trade Agreements, such as President Bush’s negotiations with Colombia, Panama, and South Korea, are more than lacking in the “fast” department. Protectionist wings in the government often acting on behalf of special interests tabled the agreements for years after their negotiation, even though they were undoubtedly beneficial for the vast majority of Americans. The TPP is a series of ongoing trade negotiations between the United States, Canada, and many Pacific nations, including Japan and Australia. Meanwhile, the TTIP is a highly similar trade negotiation between the U.S. and the EU. Details of the negotiations are hard to come by, but the main intents of the partnerships are to eliminate/lower tariffs (of which Japan is especially guilty), and the standardization of laws – including labor, environmental, trading, and intellectual property regulations. Once again, one major source of disagreement with these agreements is the fact they are negotiated and drafted in secret. However, drafts are not exactly as secret as often presented. “ Providing access to the full negotiating texts for any Member of Congress, including for Members to view at their convenience in the Capitol, accompanied by staff members with appropriate security clearance. “Holding nearly 1,700 Congressional briefings on TPP alone, and many more on T-TIP, TPA, AGOA and other initiatives. “Providing Members of Congress with plain English summaries of TPP chapters to assist Members in navigating the negotiating text. “Previewing U.S. proposals with Congressional committees before taking them to the negotiations. When anyone claims Congress is unable to view and/or understand the negotiated drafts, this appears to be whole-heartedly false. The other major controversial aspect of the agreements was concerns of corporations using international courts through Investor-State Disputer Settlements to circumnavigate laws that preserve public health/safety regulations implemented at home. Australia recently enacted a law that prohibits plain packaging for cigarettes. Essentially, they replaced standard cigarette packaging with grotesque pictures (similar to the ones nearly passed in the U.S.) that show the future consequences of smoking. Then Philip Morris used the shady tactic of suing Australia in an international court via ISDS in order to reclaim its profits lost from the public safety measure. However, this appears to be a gross simplification. Philip Morris is suing not from “lost profits,” but from the Australian government’s expropriation of their brand name, trademark, associated goodwill, etc. without any compensation. To my (admittedly uniformed) eyes, that appears to be, at the least, a legitimate reason for a lawsuit. Regardless, nowhere could I find an expert writing they actually expected Philip Morris to succeed in their case (as ISDS cases typically have to show deliberate discrimination against the company in question). So, if that is the circumstance, does that not mean international courts and ISDS work? Regardless of the Philip Morris case, it seems most ISDS cases occur when, under the guise of public safety and health regulations, governments deliberately target foreign companies on behalf of native special interest groups. One classic case I found was that of Ethyl Corp and Canada. Much like the Philip Morris Case, most critics of the lawsuit seem to believe the corporate shills at Ethyl Corp sued Canada to protect their profits at the expense of the Canadian public. In reality, the Canadian government banned a fuel additive that so happened to be used by a single company, which happened to be the foreign Ethyl Corp. The Canadian government stated the ban was the result of public safety concerns in regards to the fuel additive. However, by their own repeated admission (relevant section on health starts on page 4), there was absolutely nothing unsafe about any of Ethyl Corp’s product. Yet, if the Canadian Government already repeatedly demonstrated that nothing Ethyl Corp did harmed the public health, why on earth would they ban the additive they used? Well, the answer to that is likely the fat $20 million settlement Canada made to Ethyl Corp in addition to a formal apology and withdrawal of the law. Another similar case seems to be Hamburg-Vattenfall, where the Green Party governing Hamburg began arbitrarily creating/raising regulations against the Swedish coal company Vattenfall, with zero scientific basic for the rules they enacted. Again, Germany lost this case not because corporations are in cahoots with international courts, but because they were deliberately discriminating against a Swedish company with no scientific basis. If anyone can point me to a single successful ISDS case that was not justified, I would be immensely impressed. Of course, all of this doesn’t take into account that ISDS have been a feature for many years now for most countries involved in the TTIP/TPP, due to previous bilateral trade agreements. The most striking example I found was Chapter 11 from NAFTA, so again, it is not like any of this is unprecedented, either. Who Supports the TTAIs (T Trade-Agreement Initialisms)? As aforementioned, Congress does, in fact, know a great deal about the ongoing trade negotiations. However, the public at large really does not know the specifics of any of the agreements. Therefore, I find it prudent to exercise caution before mindlessly advocating for legislation I know nothing about. Regardless, many prominent economists from across the political spectrum are already advocating for the anticipated legislation, with Harvard Economics Chairman Greg Mankiw openly wondering if Congress would be able to pass Econ 101. The way I see it, the TTIP/TPP will work one of two ways. The first is that they, like most trade agreements before them, will marginally raise welfare of all signatory nations, all the while standardizing several practices. Either that, or Obama will try to plunge us further into the dark recesses of the netherworld. 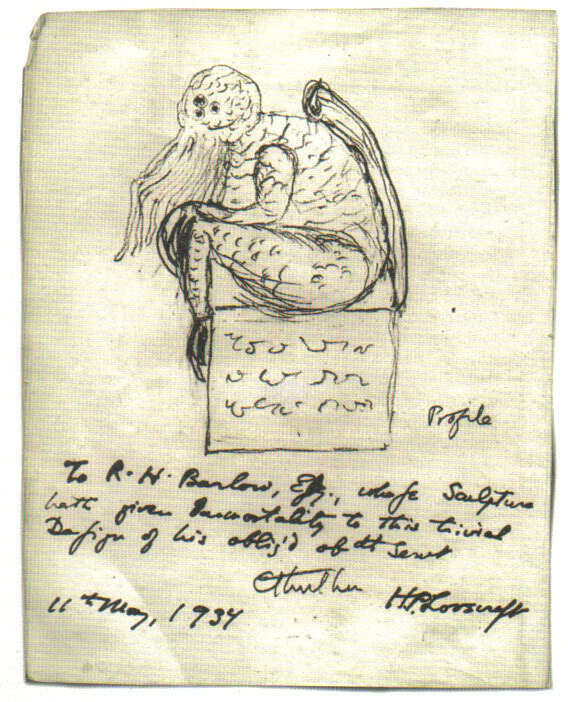 Cthulhu – to many the only threat more worrisome than international trade negotiations. Want world peace? Support free trade.